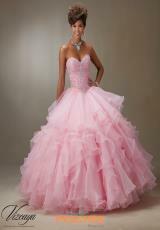 Beautiful Vizcaya Quinceanera dress 89061 features a sweetheart neckline and organza ruffled skirt. Featuring a beaded bodice and full organza material skirt with multiple overlay tires. Gorgeous bead work showcases an intricate design. Corset lace back is form fitting to give you a great figure. Look for more Vizcaya dresses for your Quinceanera or sweet sixteen at Peaches Boutique.